Sitting in the quiet of the night listening to this disc I recently acquired, the thought entered my mind to write a few lines about it. Not something I originally intended but I guess this is what makes blogging fun – being able to write spontaneously and sharing things on the spur of the moment. So here we go. I have a feeling that Mekaal Hasan might be someone who needs some introducing to readers in the western hemisphere so I will start by telling a few details about this wonderful musician. He was born in Lahore, Pakistan, and is very widely known in his native land having acquired quite a following among the music loving populace. In addition to Pakistan and Afghanistan he is also popular here in India like many of his compatriots. Music has always traveled freely on the Indian Subcontinent crossing all divides and creating a bridge of understanding. Art just seems to have that power and as such should always remain free of political taint. Hasan’s father’s passion for jazz gave him his early influences along with traditional music of the subcontinent and of course the all pervasive Bollywood film songs which we all love. Later during his studies in Boston at the Berkley College of Music he gained exposure to a wide variety of western music in addition to the traditional music forms. Maybe this partly explains the highly cosmopolitan nature of his output. After returning to Pakistan in 1995 Hasan set up Digital Fidelity Studios, where many Pakistan’s top artists record. Towards the end of 2000 he formed the Mekaal Hasan Band a group to which the present disc is attributed. He has also played bass for Junoon, a pioneering Sufi Rock band also from Pakistan. Hasan is also known widely for his production, record engineering and mixing talents and has produced/engineered the biggest names in Pakistan’s music scene as well as engineering for jazz artists from Europe. Mekaal Hasan is an important figure in the Sufi Rock genre that has gained popularity on the subcontinent during during the last 15 years or so. The term covers a wide range of pop/rock music, which draws much of its lyrical content from great Sufi poets and mystics. The most popular lyrical sources are well known poet-mystics like Baba Bulleh Shah, Mirza Ghalib and Waris Shah and in some cases also modern poets. I will write about these poets more in detail later. The fact that Sufi Rock popularizes mystical poets does not mean that Sufi Rock is religious music as such. It has spiritual connotations but the poems used are often highly allegorical and can also be taken as eulogizing worldly love and intoxication as opposed to a more religious interpretation. The message is always uniformly about love, tolerance and peace as this is what appeals to the majority of young people everywhere. Yes, even in those regions that your media might have you believe that they are mostly preoccupied in making bombs. On to the music although briefly. I don’t plan to take apart this album song by song like with some previous ones as that would not serve the purpose here, but will rather just give you the gist of it. Mainly I wanted to use this review as an opportunity to introduce this fascinating genre. Indian readers are already aware of it but many in the west might not be and that would a shame as so much interesting stuff is going on here. In the future I hope to write more about Sufi Rock and its foremost exponents, especially my favorite Punjabi artist Rabbi Shergill, whom I even had a chance to meet once briefly. This might be called Sufi Rock but what it would sound like to most people is World Music mixed with jazz-rock influences. If you are from Finland, think 90’s vocal period Piirpauke and imagine them in India, then you will have some idea what I’m talking about. In other words these fellows prefer a rather lively approach to their expression, not the more mellow mystical romanticism of some of their co-acts. Which is not necessarily a bad thing. The album on the whole has a positive almost Reggae-ish vibe to it in places, which is very uplifting. Some songs like Sanwal are in fact straight out Reggae. Mekaal Hasan’s trademark guitars are impressive in places, especially some solos he takes here and there are very original and more than just stuffing for the songs. They are haunting to listen to in a nice way. He masters a variety of styles ranging from blues to heavy metal riffing. Funk elements are also strongly present throughout the album and specifically bass guitarists will find a lot to excite them all the way (that’s me). Bhageshwari for example is pure funk bass from beginning to end with some Indian style scatting and rather heavy guitars pasted on top. One of my favorite songs is Waris Shah, a longer and quite progressive piece with a lot of soul and roots firmly in place. The anthemic Andholan gives me shivers down the spine for some reason, and not in a bad way. In a nutshell – these guys know how to play their instruments and they plan to make it clear by the time the CD is over. If you’re looking for a more grungier garage type of performance this one is not for you. In just a few places the album does admittedly fall into a kind of musical besserwisser-ism that sometimes taints this type of fusion music with that look how technically prominent I am-pose taking center stage. But hey, when you have talent why not bring it on and it does actually suite this more virtuosic of the Sufi bands. The music definitely has an addictive quality and invites me to put it back on even if just to try and make out what’s really going on as this is rather complex and intricate music. This CD is a very worthy effort in many ways and a welcome addition to the ranks. I am glad to own it even though it does not necessarily occupy top rank in my Sufi Rock collection. Having said that I know many who prefer this to my favorites so if you like more upbeat stuff then this might be your choice. A very talented band. Let that be the final words. Like I mentioned earlier I will introduce more Sufi Rock in future posts. Stay tuned. You can buy the album as an Mp3 download from the amazon.com powered store by clicking here. 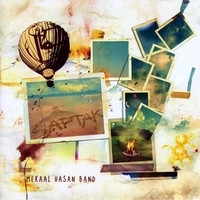 I’m from Pakistan and a big fan of Mekaal Hasan Band. I haven’t heard the album yet but I really like the review. They’ve previously released singles from this album so we know it’s pretty AWESOME…. This is the cd iam currently listening to in my player. Mekaal Hasan Band has no equal in any part of the world! Thank for the comments gentlemen. Just listening to the album again and it continues to impress me more and more. What great musicianship !! !